Christini. We won’t blame you for not hearing that name before, since Christini is a very small mountain bike company based in Philadelphia in the US. 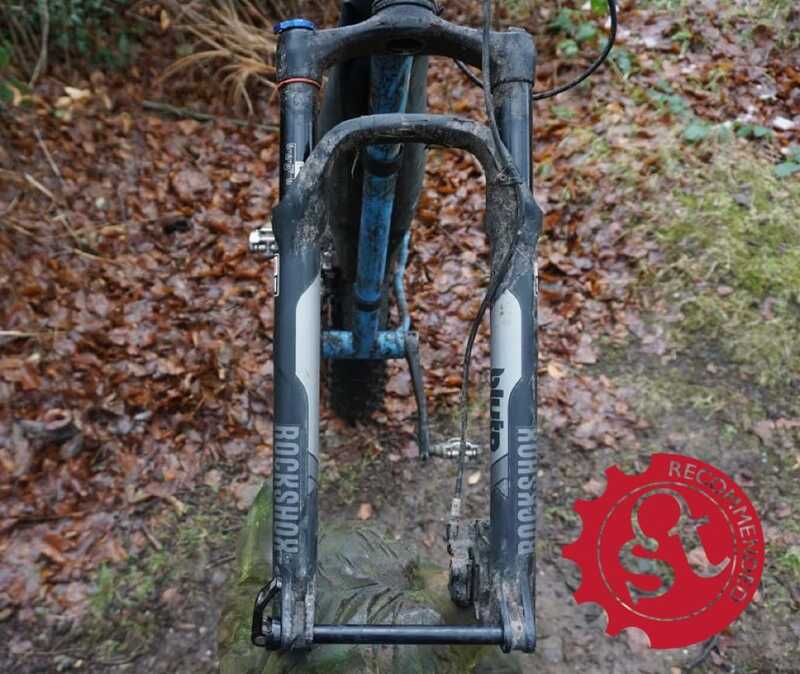 Reach into the depths of your memory though, and you may recall hearing that name from about a decade ago, when the company debuted a full suspension mountain bike that was equipped with an all-wheel-drive system. That’s right; 2WD, or AWD depending on how you look at it. It was a highly proprietary system that was designed, engineered and built in the US, with a series of worm drives and connecting drive shafts that utilised torque from the rear hub to drive the front wheel. Chipp remembers actually riding one of the early models at Dirt Demo in the US, where the AWD system allowed for masses of climbing traction up very loose surfaces. Kate Leeming hopes to be the first person to reach the South Pole via bicycle. Her tool of choice? An AWD Christini Fat bike. As of today, Christini is still the only brand that offers a mountain bike with AWD. Most likely because it’s quite a complex and difficult engineering design to execute. After a few years of interest though, Christini dropped away from the scene while the owner, Steve Christini, focussed on 2WD motorcycles. 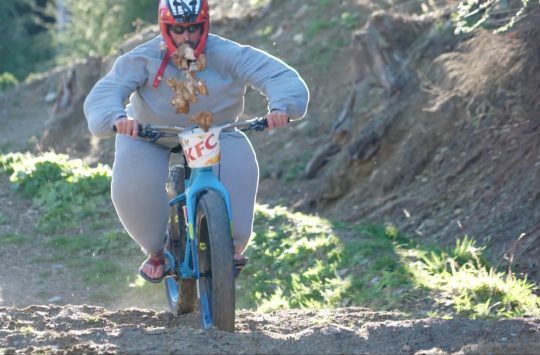 During the time that he was away from mountain biking, the humble fatbike has risen to widespread popularity. 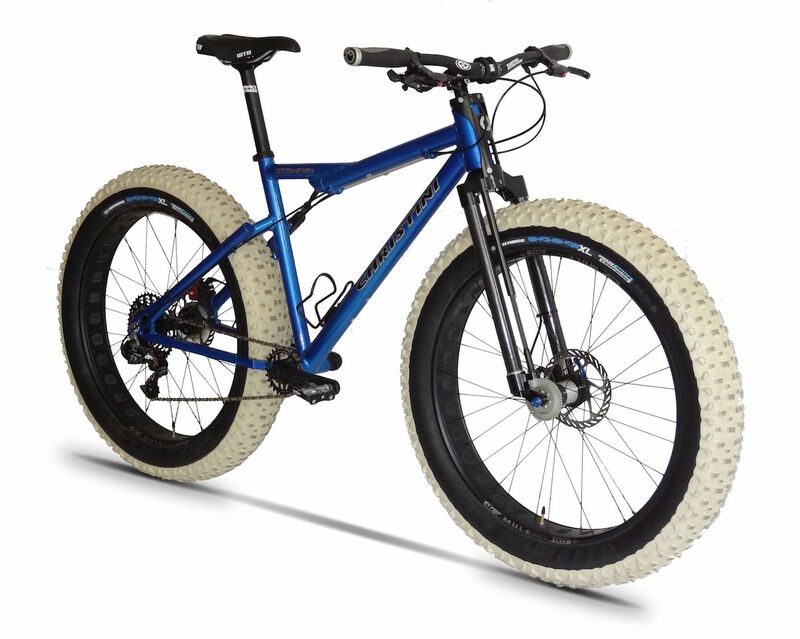 And if there was ever a type of bike that could make the best use of an AWD system, it would be a go-anywhere fatbike. In 2013, Christini partnered with Carver Bikes to develop an AWD fatbike for Kate Leeming. Leeming has her sights set on being the first person to ride to the South Pole, and required a highly capable mountain bike to do it with. As it turns out, an AWD fat bike would appear to be an ideal tool for such a job, with its high volume, low pressure tyres and AWD system providing additional traction across the snow and ice of Antarctica. With this new project in development, Steve Christini is focussing his attention back on mountain bikes. 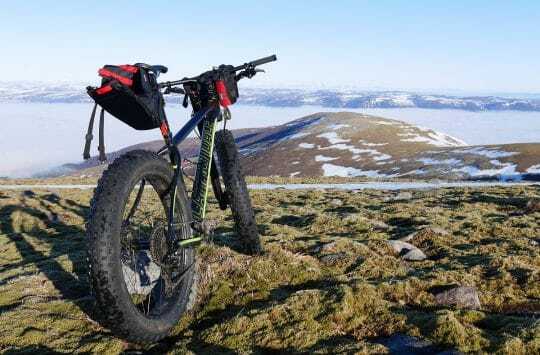 And via a newly launched Kickstarter campaign, the small US brand is hoping to make the Christini AWD Fat bike a reality, while also helping to fund Leeming’s World Record attempt. 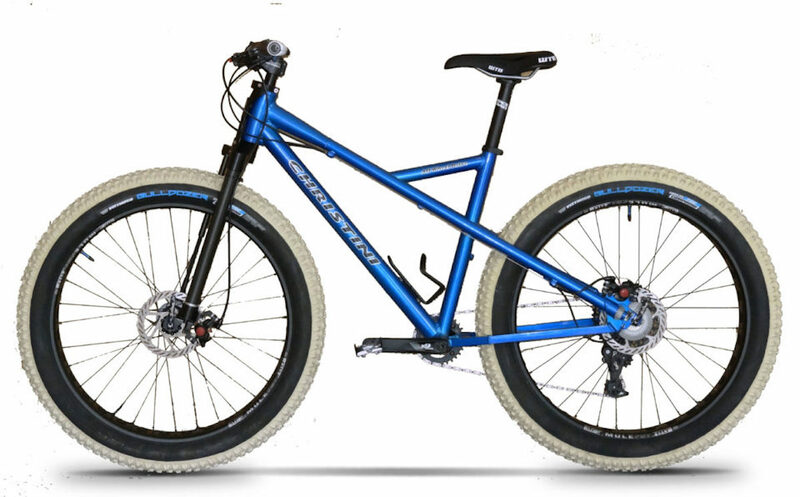 The Christini AWD 4in Fat bike. Can you spot the differences? 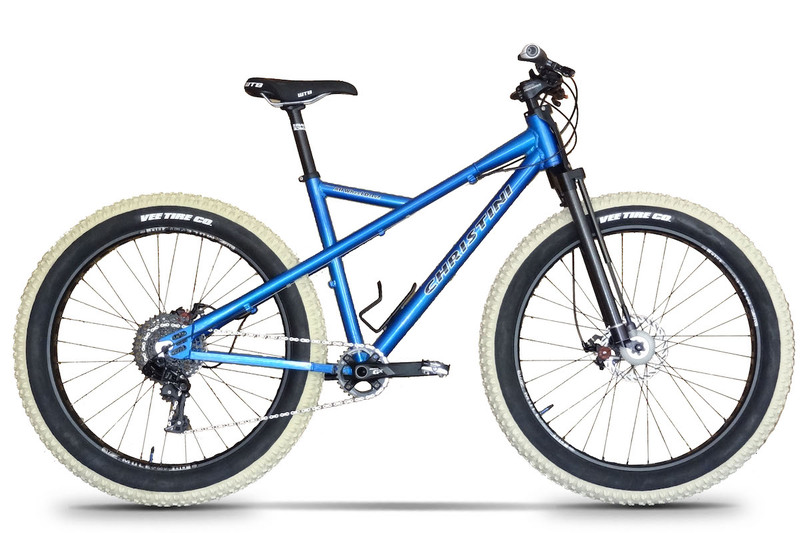 Alloy frame bears the same gearing and disc brake systems as other comparable fat bikes on the market. And here is where it gets interesting! …but on the non-drive side you’ll find a slightly unusual arrangement. 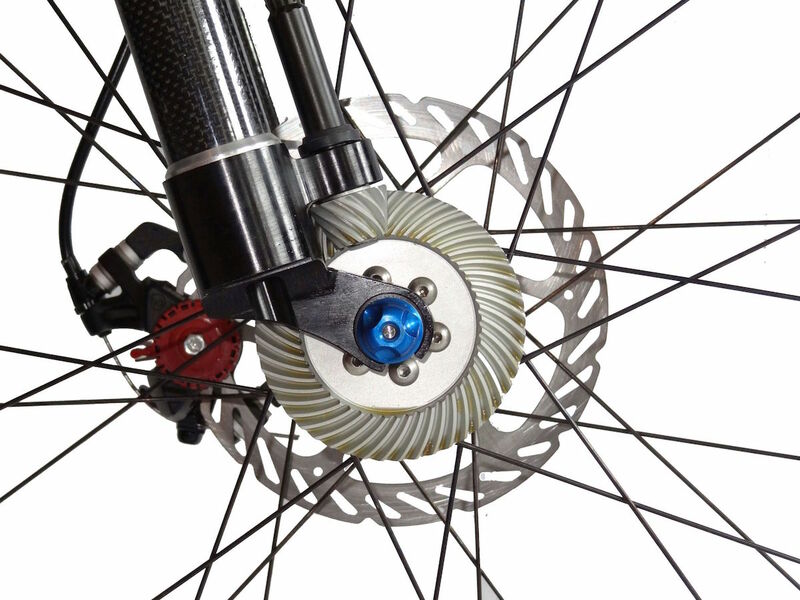 A spiral gear drive is attached to the rear hub, and and a corresponding drive cog sits inside the dropout. There’s a small actuator arm and cable that allow you to engage or disengage the clutch, so you can flick between single-wheel-drive and all-wheel-drive. Behind the integrated fork cover that shields the head tube is a bore that conceals the spiral drive found within. 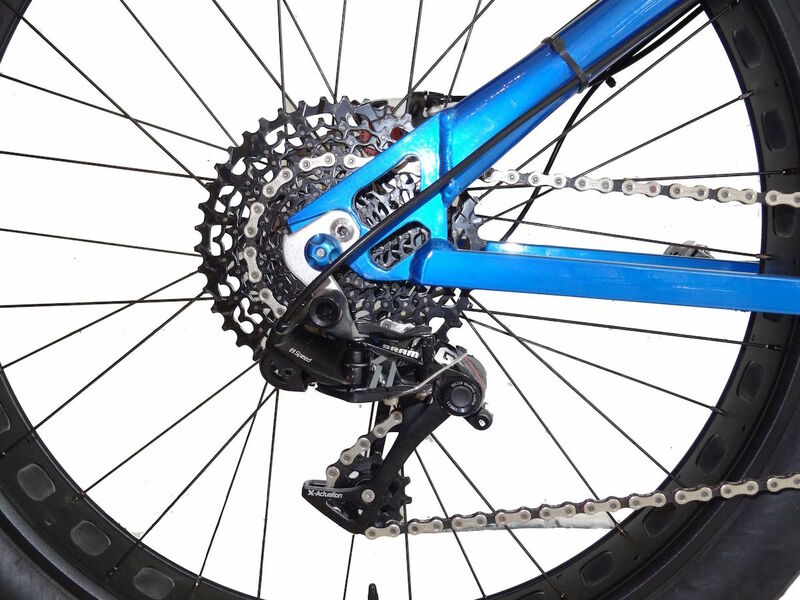 From the rear dropout, a drive shaft extends up through the top tube to the head tube, where another spiral gear set is located. 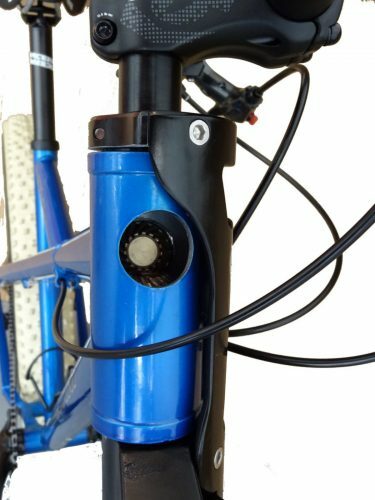 From the drive side, the external shaft running down the fork leg is really the only visual clue that something is up with this fat bike. This in turn drives another shaft down the front of the drive side fork leg, which connects to another spiral drive that locks onto the front hub. And so that (in a nutshell), is how the Christini AWD system works. Christini claims the AWD system is highly durable, and much more wear resistant than the rest of the gears on your bike. “The effect is awesome. Instead of stalling when the rear wheel slips – the front wheel hooks up and you keep climbing. Instead of glancing off a slippery root – the CHRISTINI AWD tracks right over it. Instead of washing out the front end in an off-camber corner – the front wheel literally chews it’s way through the turn. The CHRISTINI AWD is simply the best climbing mountain bike on the market with the amazing downhill benefits too. When a front end tucks, the wheel stalls, stops turning, and begins to push. With the AWD system, as soon as the wheel begins to stall, power is delivered to the front wheel, forcing it to turn. With the front wheel under power, it is nearly impossible to wash out the front end.” – Christini All Wheel Drive Bicycles. Christini’s AWD Fat bike will be offered in both 4in and 5in specific versions. 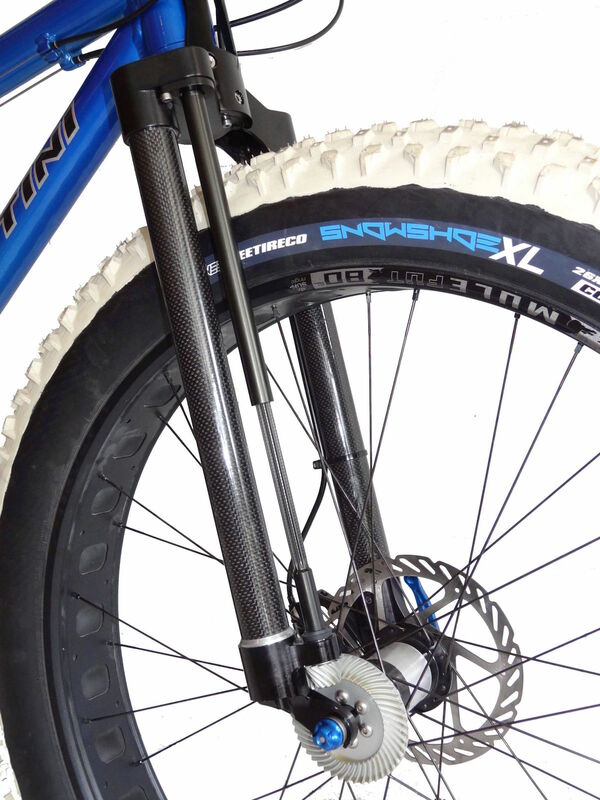 Because of the extra bends around the big 5in wide rear tyre, the AWD 5in Fat bike runs a universal joint near the middle of the top tube. In addition to the 4in Fat bike, Christini is going to be building a 5in Fat bike as well, which has (you guessed it!) clearance for 5in wide tyres. The frame is a little different due to the clearance requirements of the bigger rubber, and as you can see in the above photo, it requires a universal joint to connect the main drive shaft to the rear drive shaft. You can actually see the universal joint, where it’s exposed just below the seat tube junction. Christini also has plans to offer a 29in hardtail mountain bike, and a 29in full suspension mountain bike, so this could potentially be the start of a new direction for the small company. Want to know more about the Kickstarter campaign, Kate Leeming’s Antarctica adventure and how that AWD system works, then checkout the video below. Going by the old adage ‘If it looks right, it probably is right..’ that will be brilliant if the engineering and componentry is up to the job. I remember seeing an early Christini AWD bike in Mountain Bike Action. I think it was 1993! It’s crying out for a Pinion gearbox version. 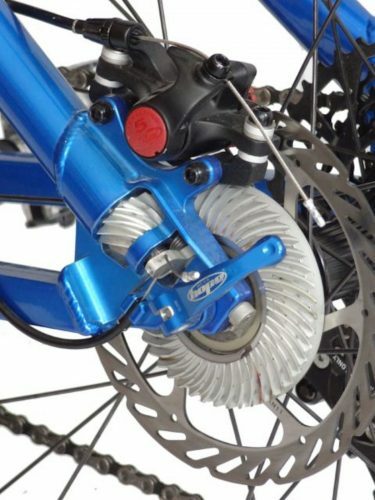 And while we’re at it, how.abiut fully enclosed shaft drive to the rear wheel too? I’d love to have a go on one. Saw one of the full sus bikes in a shop in NZ a few years ago. Didn’t ride it but had a good look, was surprisingly light for what it was. Like the “can’t wash out the front over wet roots” idea, where the rear forces the front to keep rolling. Must be a pig in tight corners, as the rear runs a tighter radius than the front. And you can’t do skids! If it had a sprag clutch or freewheel it would fix that I suppose. I met Kate Leeming at Constable Point in Greenland last May where she was out training for her South Pole attempt. It was very interesting to talk to her about the bike and its development – especially all the mechanics tucked away inside the frame tubes!